If It Weren’t For Grandmothers, We Might Still Be Apes. 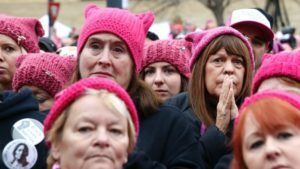 Could 100 million women be wrong? Some people in China think so. The dancing grannies typically get together in public parks to practice, exercise and just, dare we say it, have fun. This puts some others in a snit. They are reluctant to give over public space to these women. Things have gotten so bad that dogs and feces are now part of the equation. But the dancing grannies are tough — and numerous. They are the fastest-growing segment of the population. But back to the concept: In the pre-m.r.i. days, scientists wondered if they might be able to find one particular neuron that recognized one particular thing, which meant that, for each thing that we “knew,” we would have a separate neuron. Lettvin illustrated the concept with the idea of a grandmother. Would the same thing that allowed us to recognize our grandmother’s dress, for example, let us recognize a picture of her facing sideways? It was later reported that Lettvin used the grandmother example as a parody. Because everyone has one (or two)? Because we would obviously recognize our grandmother? Fast-forward several decades. In the early years of the 21st century, with the advent of functional m.r.i.’s, researchers could see how the living brain reacted to stimuli. And the grandmother idea got some traction. Experiments showed that a pinpoint of the brain lit up when the subject saw Jennifer Aniston — a photo of her, or even her name. A different pinpoint lit up for Oprah Winfrey. This time around, scientists called it the Jennifer Aniston neuron. Interestingly, it also lit up when the subject saw a picture of Lisa Kudrow, Aniston’s co-star on “Friends.” Likewise, the Luke Skywalker neuron also fired to the image of Yoda. This has helped scientists postulate that, while the neurons in the hippocampus respond to the concept of a particular person, they are also linked to related concepts. That means that we don’t have to remember every single detail; it is enough to link associated ideas. These “concept cells” link perception to memory. They are the building blocks of memory. And grandmothers, we know, can be bound up with memories. Letvin’s idea of the ubiquity of the grandmother was spot on. Now we know that memories are linked to emotion. So far, it’s a state-by-state movement, with grandmothers in Seattle, in Kansas City, on Cape Cod. It began as a response to the shootings at Sandy Hook, and has been picking up momentum. 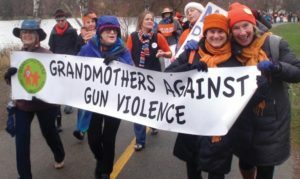 Grandmothers have been marching, and meeting with state and congressional representatives to promote a saner and safer approach to guns. Following the horrific shooting in Florida, the youngsters affected have acted like grown ups. So we nominal grown ups can follow their lead. Some of us have memories of working on campaigns back when we were the ages of today’s high schoolers — we fought for nuclear disarmament, civil rights, women’s rights. For others, this is the first time that they have marched. Too often, they are active because the violence has marked their own families. But orange is a good color. It keeps us visible, and links us across age and party lines. Here’s to more marching, and to more results. Why on earth was I surprised? 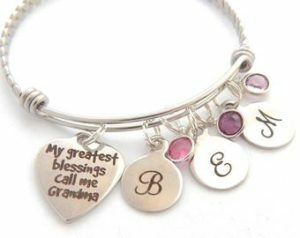 My own grandmother had a bracelet with a dangling charm for each of her grandchildren. But clearly, I have not kept up with the changes in the grandma jewelry market. But then I realized — by photo dog tags, they did not mean tags for actual dogs. They meant necklaces made in the shape of the old “dog tag” i.d. But now I am worrying: am I a bad grandmother because I don’t know the birthstones of any of my grandchildren? Maybe the most weird option is a butterfly-shaped pendant that says, “Now she flies with butterflies,” which I assume is about a grandmother who is dead. Who would wear that one? Or is the idea to order it quickly and slip it in Grandma’s coffin before she flies off to Butterflyland? Luckily, expedited shipping is available. Want to watch a new grandmother splutter and try to retain her self-control? Just ask her about safety. Sure, we know that the goal is to prevent injury and save lives, but sheesh! don’t these people know when to lighten up? These people would refer to the parents; the adults who are setting the rules and establishing the standards of proper behavior — standards that the new grandmother must follow, or at least pretend to, when the parents are in sight and/or the little ones are old enough to snitch. 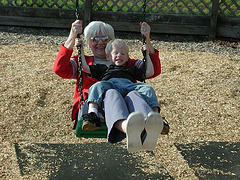 But there is still a good possibility that you, as the grandparent, will go along with rules. After all, 1) It is not your child. 2) You don’t want to run the risk of alienating your actual child (the parent in the situation. 3) What if your luck runs out and the baby/child injures itself on your watch, and you have to admit that YOU WERE NOT FOLLOWING THE RULES? You, who, in the faraway past, tore your hair out getting those very people to understand the concepts of risk, prevention, thinking ahead, etc. etc. etc. The problem is that standards have leapt up several notches. There is so much more consciousness of the possibility of injury, such an explosion of specialized products, so much more child-centeredness. But when I suggested that kitchen sink possibility to the new parents, you would have thought I was advocating…..oh, let’s not go there. So, at the baby’s house, I dutifully used the baby gizmo. By the time the baby came to visit me, I even bought one for my own kitchen. Did I learn to love it? No. Every time I used it, I had the same mental conversation: Ok; I see how this would make you feel better if you were anxious. Is there something wrong with me that I had not been sufficiently worried about bathing my own newborn in the same stainless steel sink where I had washed onions, and which I cleaned out with products that were probably poisonous? Or did I now, with my failing mental powers, just not remember? Even in the form-fitting cozy plastic tub, my grandchild baby was able to squirm and cry and generally act uncooperative at times, although at other times, said baby was a model of infant delight, enjoying the gentle pat-down with the soft, tiny baby washcloth and the premium baby soap. I enjoyed knowing that I was doing the right thing; that my children and my children’s spouses would not be branding me as truculent or worse. I had passed the first test of grandmotherhood: maintaining family peace. Amy Craton began her college career with high hopes, in 1962. Unfortunately, a divorce and single parenthood forced her to drop out in order to support her four children. Fast forward (maybe not so fast) half a century. In 2013, she decided to finish the degree that she had begun. 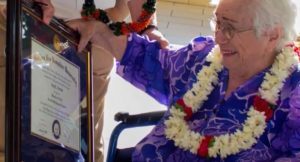 By this time, the New Englander was living in Hawaii, far from her original college experience. She also knew that she would not be able to handle campus life at any school. But an online program at Southern New Hampshire University seemed like a good fit. She completed her major in creative writing and English with a 4.0 average. So Craton is beginning the course work for her master’s degree. When Mary LaCava’s first grandchild went off to college, she tucked a twenty dollar bill into an envelope and, using old hotel stationery, sent it off with a short note. “I figured she could use it,” she recalled. She continued the practice every week. 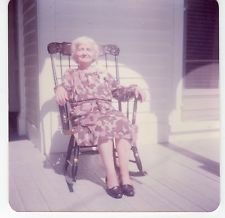 That was twenty years, and twelve grandchildren ago. This graduation season marks the end of the Nanagrams, as her youngest finishes college. LaCava didn’t miss a grandchild or a week. 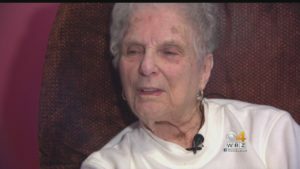 The now- 92-year-old Massachusetts woman found it tough going during the period when three of her grandkids were in college at once. But she stuck with it, even as she traded in her old stationery for special Nanagram notes. Some kids saved their money, others spent it. Nana continued her letters, always staying in touch. “They say, you start something, you finish it,” she explains. Her grandkids are delighted that she stuck with them.